Keeping your roof clean is essential for preserving the material, and catching any existing issues. To clean your RV roof, start by sweeping away any loose debris. As you go, keep an eye out for cracks, rips, and tears. If everything seems intact, use a mixture of water and non-abrasive soap to clean off dirt and stains. Always avoid cleaners that contain citric elements, abrasive cleaners, or petroleum distillate, as these can damage your roof material. Remember to always exercise a great deal of caution when cleaning your RV roof! Work in small sections, and consider using a long-handled mop or brush from a ladder on the side of your RV. Standing on the roof itself can be slippery, and quite dangerous. The stress of travel really does a number on the seams and sealants of your roof. If you find any cracks or gaps when cleaning and inspecting your RV roof, make sure to fix them right away. If left unattended, these cracks will widen, allowing water and debris to enter your RV and cause additional damage. You can choose to handle these RV roof repairs yourself, or take your rig to an RV Service Center in your area. If you are a DIY RVer, make sure that you are using a sealant that is compatible with your roof’s material. Research the material for your specific rig, or consider using an all-purpose option such as butyl tape. Before you head out to buy repair materials, do a quick scan of your owner’s manual and popular RV sites dedicated to your make and model. A little research before you complete the repair will ensure that your fix is sturdy and long-lasting. If you’d like an additional layer of support, there are several aftermarket waxes and coatings for RV roofs. While not required for a happy roof, these protection options do help block harmful UV rays and weather. If you do choose to apply a coating, be very cautious! These products will cause your roof to become extra slippery, and you will need to move with extreme care as you perform maintenance. Keeping the roof of your home-on-wheels maintained is an important part of a happy RV life! 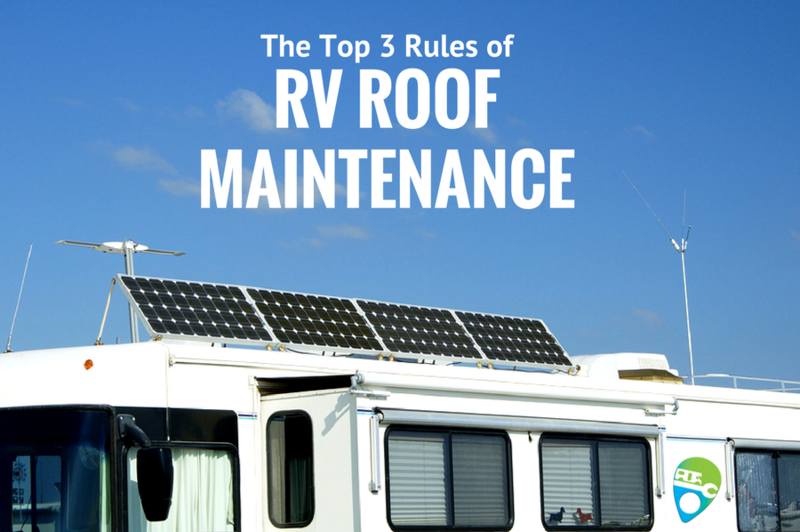 Follow our rules, and keep an eye on your owner’s manual for vehicle-specific RV roof maintenance tips.